This photograph below was lost the moment it was taken in 1929 or 1930. Mary Sporle, known as Dolly, proudly showed off her son Leslie for the camera at Wellington’s Berry & Co. studio with the intention of giving his grandparents a photograph of him. But her family believes she never returned to order prints, perhaps because the Depression was beginning and she didn’t have enough money to pay for them. Berry & Co. Mary (Dolly) Sporle with son Leslie, circa 1930. Gelatin silver glass negative, half-plate. B.043877. Te Papa. Four shots were taken in the sitting, and though clearly this one was a failure in capturing a good likeness of Leslie, the studio kept it, along with the others. The Sporles moved to Feilding a couple of years later, and the studio ceased trading under the Berry name. A succession of other photographers used the same space up until the early 1950s, and they may have taken on the collection of negatives in the hope of earning sales of prints from previous customers. But eventually the building, constructed in 1900 for William Berry specifically as a photography studio, was turned to other purposes, and the cameras, backdrops, and negatives were long gone. Or so it seemed, for in the 1990s, when the top floor was being renovated, a stash of glass negatives was found in an attic space and sold to Te Papa. Berry & Co. Mary (Dolly) Sporle with son Leslie, circa 1930. Gelatin silver glass negative, half-plate. B.043827. Te Papa. Berry & Co. Leslie Sporle, circa 1930. Gelatin silver glass negative, half-plate. B.043826. Te Papa. Berry & Co. Leslie Sporle, circa 1930. Gelatin silver glass negative, half-plate. B.043878. Te Papa. 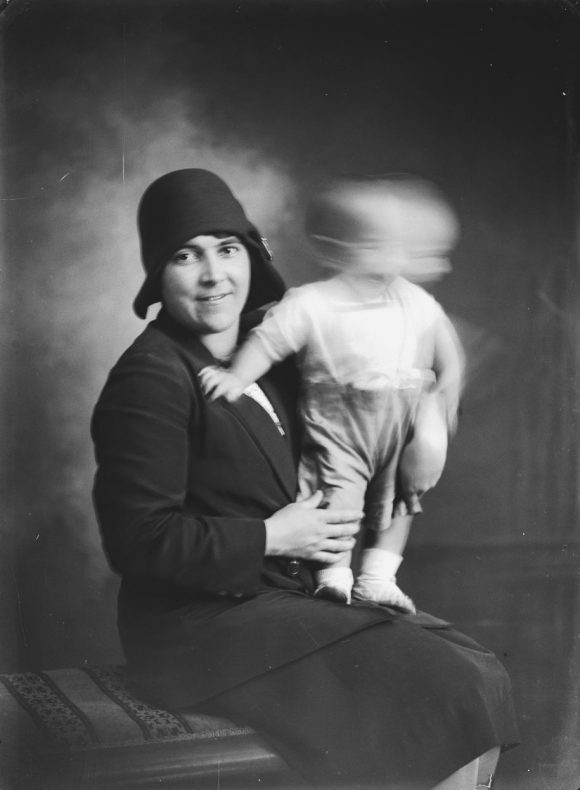 When they were scanned some years later I was immediately attracted to the image of the blurry toddler. Despite being a dud by any standard of studio photography, it wonderfully captured childhood joy and exuberance, along with maternal pride. I eventually chose it for my book New Zealand Photography Collected and the associated exhibition at Te Papa. Then by chance one of Dolly’s granddaughters was looking through the exhibition and had a shock of recognition seeing her grandmother blown up life-size. Checking with other members of the Sporle family confirmed her impression that it was Dolly. 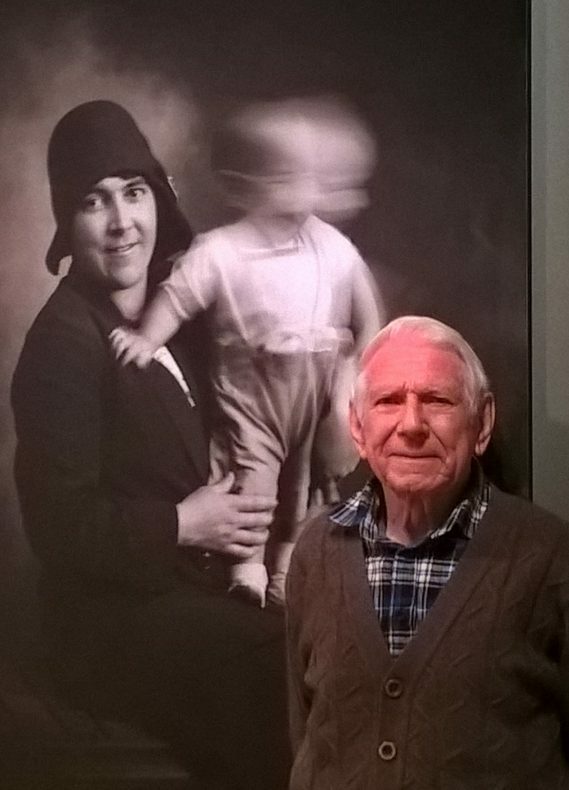 What’s more, the energetic toddler, now 87, was still going strong, and he paid a visit to see the photograph on show last week. Les Sporle with the photograph of his mother and himself as a toddler. Photo A. McCredie, Te Papa. 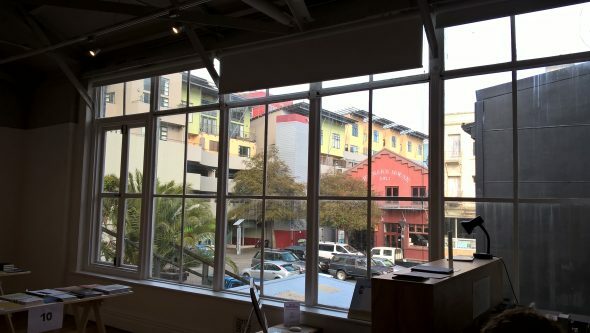 Berry & Co. Bottom photo showing studio lighting windows in Enjoy Gallery. All photos A. McCredie, Te Papa. A photograph taken more than 80 years ago still finds connections with the present – not only to where it was taken, but also to one of its subjects, Les Sporle. For the first time, he has been able to return to a long forgotten moment in his own life – one erased from his young memory soon after he unintentionally erased his face from the photograph. I’m really taken by the story..just wow! Delightful story, Athol. You may know the book “A Richer Dust”. Colin Gordon found several hundred glass photographic negatives on a market stall in Yorkshire. They proved to be all of the same family, taken over a 40 year period from the year of Queen Victoria’s Jubilee. He then began a fascinating hunt for the family and people who knew them. Well worth looking out for in a second-hand bookshop; published in 1978. Wonderful story showing us lives and also peaking behind the scenes of the old photograph studio.. Thankyou. great true story thank you, nice happy ending! 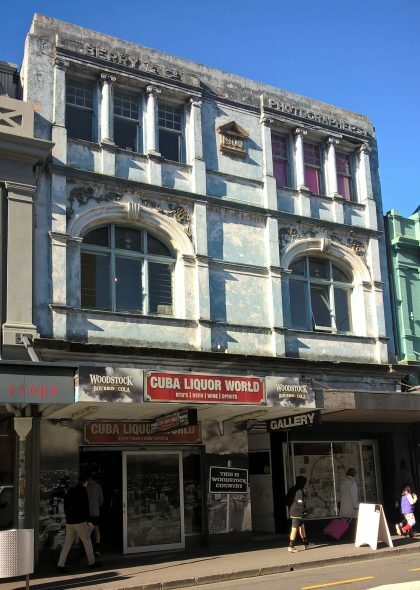 is this upper Cuba St… years since I have been around Cuba St… used to work at James Smith, they bought me out from London to work in the store.. I like the first image containing the blurry, ambiguous baby= full of movement, a direction I would like to take my own image making in. Re the ‘connection’ aspect, I recently exhibited a trio of images of a weaver friend. The first of the 3 comprises Takiri wearing a flowing korowai which billows out the back. She’s holding an old b & w photograph of her great grandparents, positioned within her cloak. Weaving binds/ connects, as does whakapapa. What a treat! Thank you Athol.